Which Pool Is Best For Your Backyard? Swimming is a cherished activity that continues to be enjoyed amongst generations of families and friends. As the summer temperatures rise, it’s natural to want to dive into some refreshing blue water and have a splash. For those of you who don’t own a pool, but are seriously considering installing one, we’d like to offer you some pool school before you jump into an installation. It’s important to consider which type of pool best suits your family’s needs and budget. Inground and onground pools often require less room to install, while aboveground pools are easier to move and are less costly. Available yard space can also be a deciding factor but, don’t let a small yard deter you from getting the pool that you’ve always dreamed of. 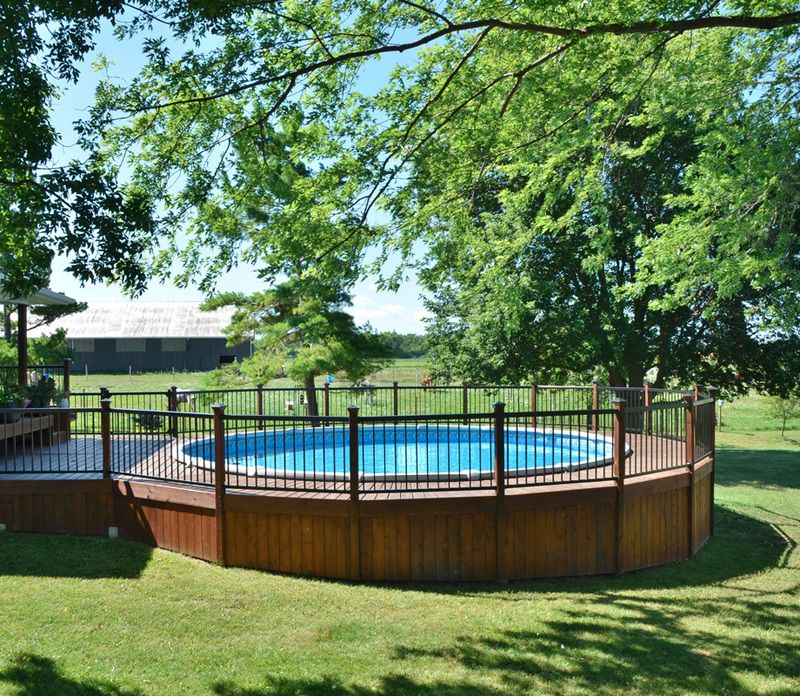 Creating your backyard oasis with an inground swimming pool is a great way to bring your family together. Whether you’re looking for relaxation and relief, or family fun and excitement, an inground pool is your answer. These fully submerged aquatic retreats provide ample customizable options to suit your overall design. 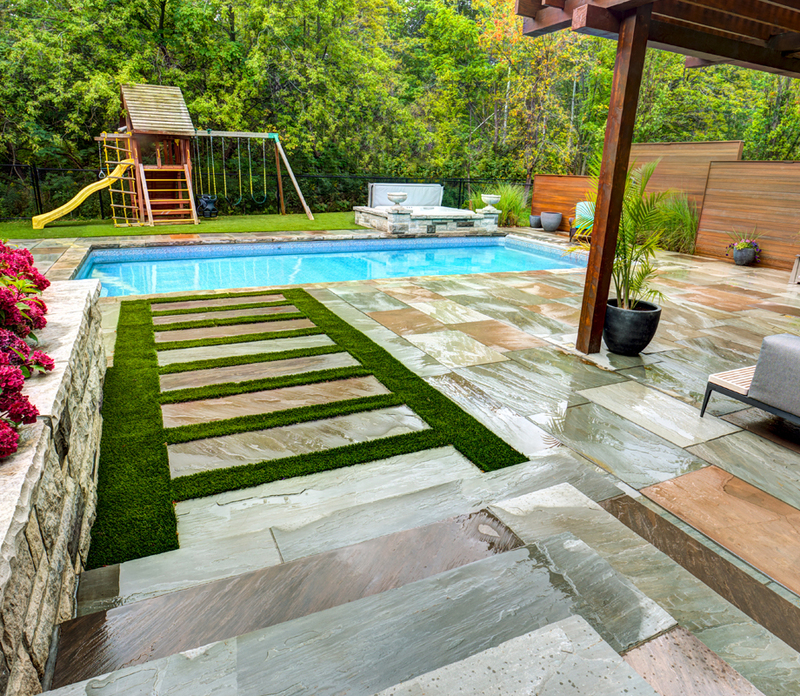 Contrary to popular belief, not all inground pools require a large backyard. The possibilities are infinite with an inground pool. If you are learning towards an inground pool, you’ll first want to decide on materials to be used. Concrete and vinyl pools are amongst the most popular options. Concrete tends to be the most expensive, but is also very strong and durable. In addition, concrete can be formed in any shape or size, therefore creating the custom pool of your dreams is attainable. We have seen a steady rise in the popularity of vinyl pools as well. Construction consists of a one piece flexible liner that is inserted into a prepared hole, and attached to an aluminum or steel framed wall. Limited vinyl pool shapes and sizes are a thing of the past. We offer a wide variety of shapes and sizes that can fit perfectly into almost any backyard. An onground swimming pool gives you the look and feel of an inground pool, but at a lower cost and with faster installation. Designed to be partially submerged into the ground, these versatile pools pair perfectly with different types of decking and are an ideal option for backyards with considerable grades. If your backyard has a sloped grade or rocky soil, do not fear, you can still have the pool of your dreams. Onground pools are similar to inground pools more so than above ground pools. They are partially in the ground and are constructed similarly to inground pools with heavy steel and aluminum walls. Because of the unique qualities of ongrounds, they tend to come in limited shapes and sizes. However, due to their heavy-duty engineering, they are designed to provide exemplary structural support for years to come. Above ground pools come in a wide range of shapes and sizes that can be big enough to accommodate a large group of swimmers. Above ground pools, as the name suggests, are pool structures that sit above the ground. Above ground pools often do not require much construction and are installed within a matter of days. Above ground pools are affordable and typically require less maintenance due to their size, smaller-scale installs, and lower operating costs. Due to the seamless construction of these “out of ground” pools, their components are all precision made to fit together and will ensure that your pools remain strong and durable for years to come. Above ground pools have transformed since their original models. Gone are the days of an isolated, arctic-grey, rectangular above ground positioned in the middle of a backyard. Nowadays, above ground pools feature modern designs, and can even accommodate water features, salt water systems and powerful massage jets. Above ground pools are great for families, as safety is easier to monitor. 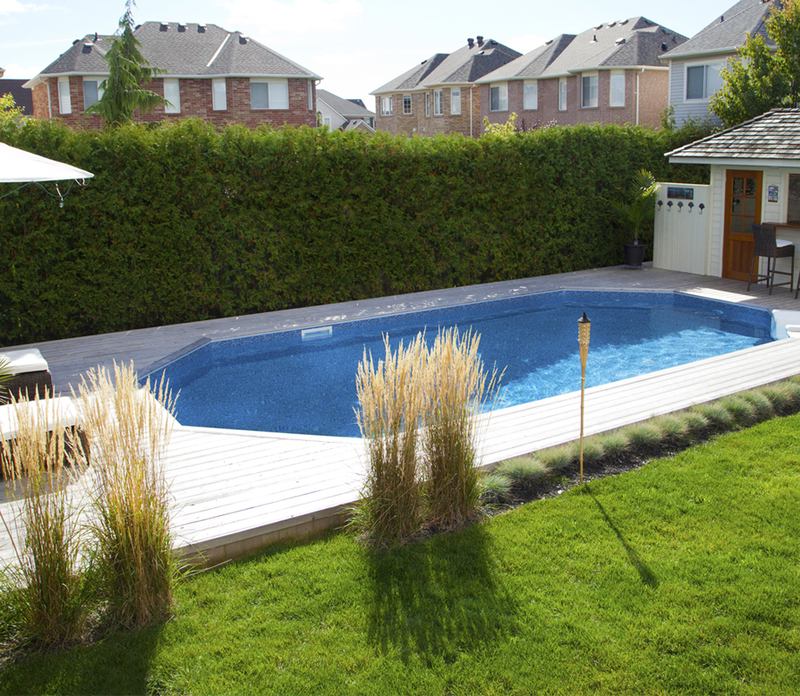 We often see decks or fences with latched gates built directly around aboveground pools. Above ground models are also useful for teaching children how to swim. Parents can comfortably stand or squat in the water while they support their child that is exploring the water for the first time. Smaller backyards can appear much larger and more inviting with the right shape and style of pool. For example, if you have a tiny yard you can make use of your backyard corner by having an “L-Shape” pool installed. By making use of your backyard’s corner, your backyard area remains spacious and welcomes outdoor entertaining. It also works to draw your eye across the yard, making it seem larger. When you take advantage of your available space, you can easily create a blissful oasis. Pool landscape design has changed significantly over the past few years. No matter the size of your yard, you can make it look exactly how you dreamed of. Ideally, the landscape around your pool should be low maintenance, provide privacy and minimize the amount of debris in your pool. Picking a theme for your landscape is always enjoyable and a great starting point to really building the overall aesthetic of your backyard retreat. Some of the more popular landscape themes we’ve seen feature modern, desert or nautical design concepts. It is important to remember that landscaping isn’t always just about plants or decking. Lighting elements and patio furniture also contribute largely to the look and feel of your backyard. Our vast collection of patio furniture features sets constructed of various materials including resin wicker, cast aluminum, wood, aluminum, recycled plastic, and more. Our wide variety of colour options let’s you find the perfect set to enhance, or stand-out amongst, the natural colours found in your backyard. These added elements will truly elevate your outdoor living experience. For more pool inspiration, click here to view our pool installs gallery.